1. Soak the beans overnight in cold water. The next day drain and put in a pan with enough fresh water to cover, and add the bay leaf, one onion and one carrot. Bring to the boil, simmer for 1–1 ¼ hours until tender. Drain. 2. While the beans are cooking, preheat the oven to 160ºC, gas mark 2. Heat the oil in a flameproof casserole dish and brown the lamb on all sides. Remove from the pan. Add the remaining onion, carrot and celery and cook until softened but not browned. Add the garlic and cook for a minute or two. 3. Return the lamb to the pan and add the tomato paste, rosemary, cider, lemon juice and zest, and seasoning. Bring to simmering point and cover the pan. 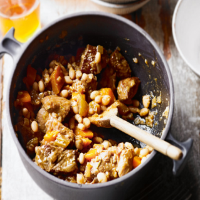 Cook in the oven for 2 hours then add the drained beans and cook for a further 30 minutes, until the lamb is tender.